Keep up to date with the latest news releases from LAWPRO. Please note: We cannot comment on specific claims files due to the confidential nature of the information and privacy considerations. Daniel E. Pinnington appointed LAWPRO President & CEO. A.M. Best Co. awarded Lawyers’ Professional Indemnity Company a financial strength rating of “A” and an issuer credit rating of “a” for the seventeenth consecutive time. Convocation of the Law Society approves LAWPRO’s 2018 insurance program for the Ontario Bar. Data analysis leads to refinements in risk-rating. Convocation of the Law Society approves LAWPRO’s 2017 insurance program for the Ontario Bar. Base premium decreased to $2,950 plus strategies to promote access to justice. A.M. Best Co. awarded Lawyers’ Professional Indemnity Company a financial strength rating of “A” and an issuer credit rating of “a” for the 16th consecutive time. On June 22nd, the Ontario Bar Association will present LAWPRO President and CEO Kathleen A. Waters with the Award of Excellence in Real Estate. LAWPRO and OJEN pioneer real estate in the classroom. LAWPRO is pleased to announce that Convocation of the Law Society approved its 2016 insurance program for the Ontario Bar. For more details of the 2016 insurance program, see our Report to Convocation. A.M. Best Co. has awarded LAWPRO a financial strength rating of A (Excellent) and an issuer credit rating of “a” for the 15th consecutive time. In addition, A.M. Best Co. gave LAWPRO a “stable” outlook for the fourth year in a row. January 1, 1995 was the first official day LAWPRO began operating the E&O program. 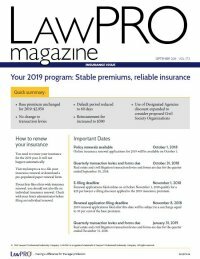 Strong financial results and a moderating claims count have allowed LAWPRO to hold the base premium for the mandatory insurance program at $3,350 for the fifth consecutive year. 2015 marks 20 years of LAWPRO operating primary insurance program. For more details of the 2015 insurance program, see our Report to Convocation. A.M. Best Co. has awarded Lawyers’ Professional Indemnity Company (LAWPRO) a financial strength rating of A (Excellent) and an issuer credit rating of “a” for the fourteenth consecutive time. In addition, A.M. Best Co. gave LAWPRO a “stable” outlook for the third year in a row.